Parts: 27 injection-molded styrene, plus a length of string for the Batarang. Instructions: 8 page booklet with clear diagrams and helpful hints from the Batphone and Batman himself in classic Adam West form. Decals: Waterslide and sticker options for belt buckle and chest emblem. Molding Quality: 9 - No flash and cleverly placed sprue gates - for the most part. Detail: 9 - Well detailed with nice inclusions of a seperate mask to aid painting the face. Accuracy: 9 - Looks like Adam West's Batman to me. Overall Rating: 9 - Nice kit that should go together easily. 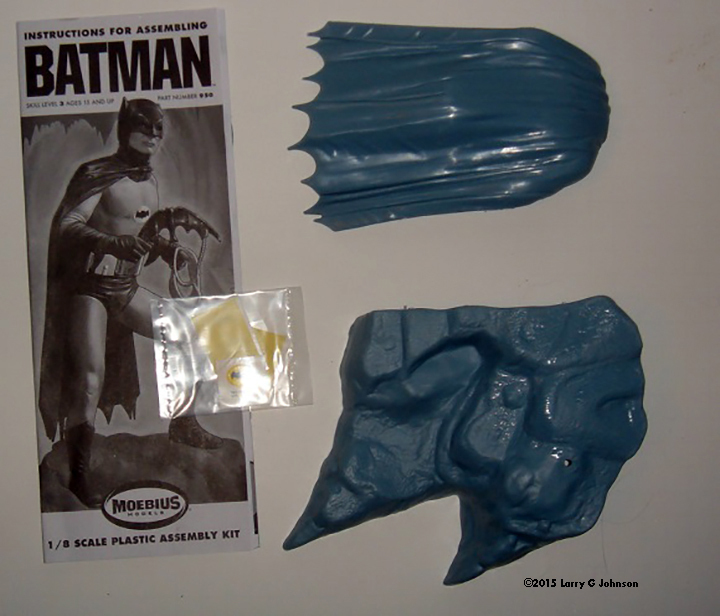 This kit is the first of Moebius' new line of characters from the campy Batman TV series of the 60's. As a huge Batman fan I still love watching the campy old series. I was very young but I even still remember watching it first run. I loved the crooked camera angle when the bad guys were on screen, the hokey 90 degree camera rotation to simulate climbing walls, the corny, over the top dialogue and the BAM OOF, CRUNCH “sound” effects! It was never meant to be a serious treatment as was Nolan's Dark Knight series. It was meant to be fun. The kit is simple but complete. 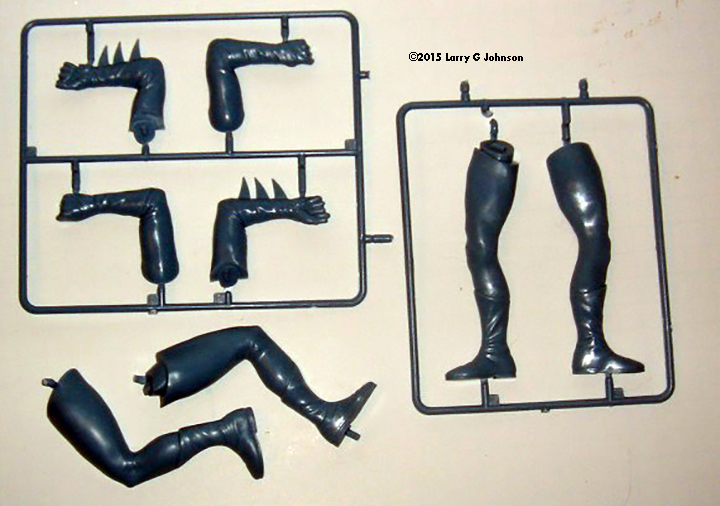 Parts are composed of four loose parts including the base (which will fit together with the other figures to form the bat symbol), cape and two halves of the left leg. The parts trees are, in no particular order, tree 1 - the torso halves front and back, tree 2 - nameplate, head halves and Batarang, tree 3 - nameplate stand, utility belt, ears, mask and face, tree 4 - arms and three 5 - right leg. You also have the decals, both sticker and waterslide option for the chest symbol and the utility belt buckle, and instructions with the Caped Crusader himself guiding you through the assembly with dialogue that embodies Adam West on the pages. Finally there is a length of string for the Batarang. There is no picture for this as I lost it examining the kit and just when I was wondering if I mistook the instructions and needed to supply the string, found the lost item. The light blue plastic is relatively hard and flash free. The parts are laid out so that gate attachments are often in concealed locations but some cleanup will be required on others. One very nice detail is the mask is a separate piece which will allow easy painting of the face. It will also sit on the face in the same way the TV cowl did, allowing one to see a little inside the mask, under the cheeks and round the eyes. I didn’t need to check any references for accuracy as I remember the TV show well, but I looked up some internet references to be thorough. 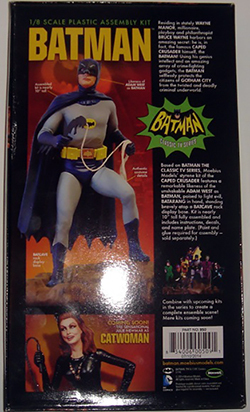 The figure as shown assembled on the box tray bottom looks 100% like Adam West’s Batman and the face is a dead ringer for Mr. West himself. 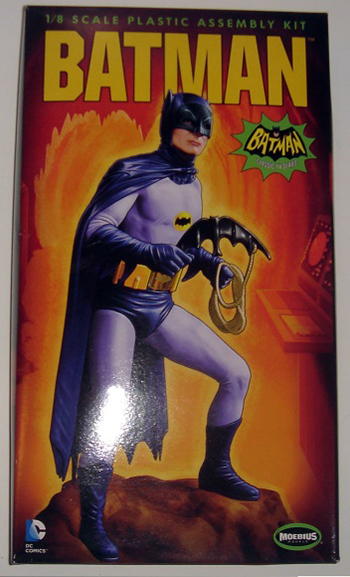 If I can find any fault, the Batarang might not be the exact shape as the TV show as per images I can find but it’s likely many different Batarangs were used in the three seasons and this may represent one of those. The only other slightly negative comment is the choice of a rocky base. Even the Batcave had nice, clean floors and most of the action had urban locales. But it is a miniscule, petty complaint. I’m very happy and impressed with the kit. All in all, it is an excellent looking kit that accurate represents the 60’s comic hero. The only other option was the old Aurora kit that went through several hands, ending up in Revell’s I think, and an aftermarket Adam West head from Diceman Creations. And we already have (at the time of this writing) Catwoman (Julie Newmar's version) out and Robin and the Penquin are due out soon. Now let me see how this kit goes together! Many thanks to Larry's wallet for providing the review sample. Manufacturers and retailers, interested in getting your wares reviewed and publicized on a site averaging 6000+ readers a day? Contact us! This page copyright © 2013 Starship Modeler. First posted on 13 March 2015.